Which nap shall I take? Crazy for the taste of seafood. This is not a cat blog. Really. More non-cat-related material is coming soon. I don’t sing — but if someone wanted to provide me with vocals, I’d be happy to put one together. And if someone wanted to just make a video and post it (subject to this license), I’d be delighted. I actually kept hearing those lines in my head over and over as I was trying to go to sleep last night. That’s right — an earbug of a song that no one has ever sung. I amaze myself sometimes. I honestly did have it stuck in my mind for days. I laughed at the video, but I lay awake that night with the lyrics and melody stuck in my head. That was actually the first bit that I wrote. Maybe I should have stopped there and made a LOLcat out of it. 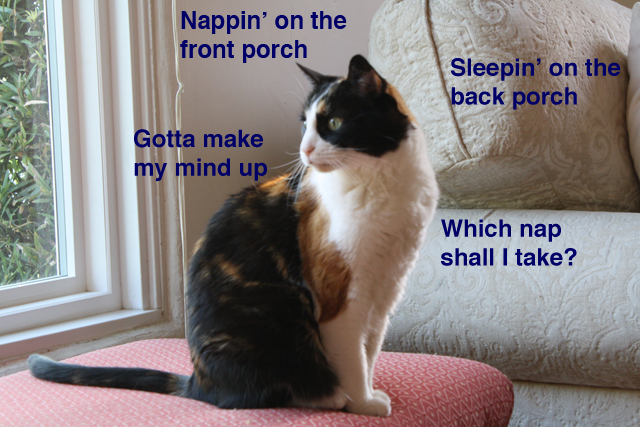 Actually, I think a LOLcat was a good idea, so I’ve added one to this post. And now I’m talking to myself … in the comments section of my own blog. Maybe I should get some sleep. But even just reading it, I too, am unable to get the chorus out of mind already. Thank you so much! I don’t have that kind of money lying around, but I called one of my cat’s wealthy friends, and he agreed to fund the project! Unfortunately, he made the check out for $5000 by mistake, and now he’s left the country for an extended vacation. But we can still work this out — I’ll just give you the check, and you can give me $3000 back, and then we can get started on the video. I’m so excited! Fun fun fun fun! As a three time cat mother you have made me proud! You turned a hideous monster of an auto tuned song into a fun and cute song! Thank you! Love your blog! Sorry — promises made in comments on this blog are legally binding. I’m looking forward to receiving vocals from you within the next 72 hours. This is what that song no matter the lyrics sounds like. Purrfect song parody. I wonder if my cat secretly sings, too. My cat says she’s never run into yours at Feline Karaoke night, but I guess that doesn’t really prove anything. I’m sorry to say that I’ve never heard of Rebecca Black, or her song. I had it on in the background whilst reading along with your lyrics… and only found myself singing along! Great post, laura! I read this post weeks ago and still find myself saying, “Scarffin’ it scarffin it, yeah!” I realize your song says snarfin’, but I think I forgot that until just now. I actually kept going back and forth between scarfin’ and snarfin’ as I was writing this.